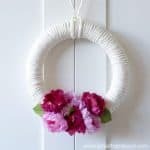 A Seasonal Wreath - the solution to your storage dilemma - Girl, Just DIY! If you’re like me you love the look of wreaths on the front door. And you love all the beautiful variations you see online and while scrolling through Pinterest. But where do you store them all? I don’t have enough room to store six or more wreaths (small home soul, remember?). 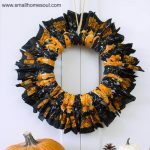 As I type this the Easy DIY Fall Wreath is still sitting on top of the dresser behind me in the spare room. Partly because I’m a bit disorganized and partly because I’m not sure where to store it. 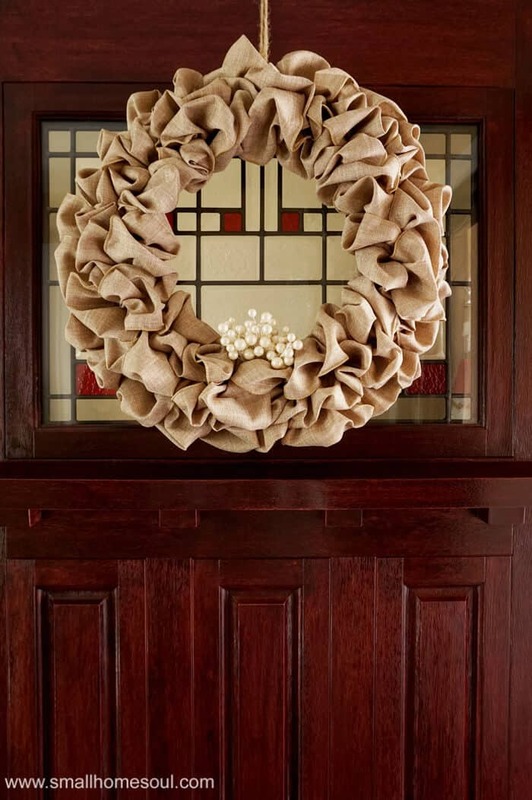 Enter, the Seasonal Wreath, the solution to your my seasonal wreath storage dilemma. I have to thank my friend Anika over at Anika’s DIY Life for this inspiration. 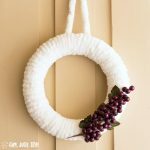 She made this very same thing last year using a grape vine wreath and quickly and easily changed it out with the seasons/holidays. All her wreaths were quick and easy and adorable! 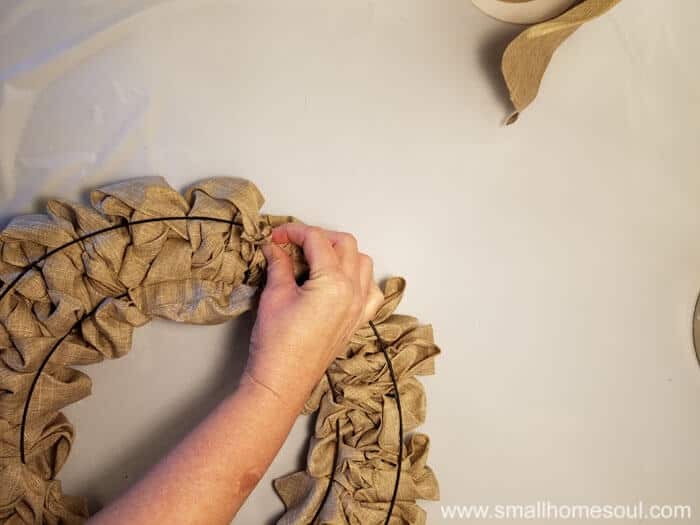 My seasonal wreath uses ribbon as the base and while I would have loved to do a burlap wreath I chose to use some wire-edged linen ribbon that has the appearance of a tightly woven burlap. 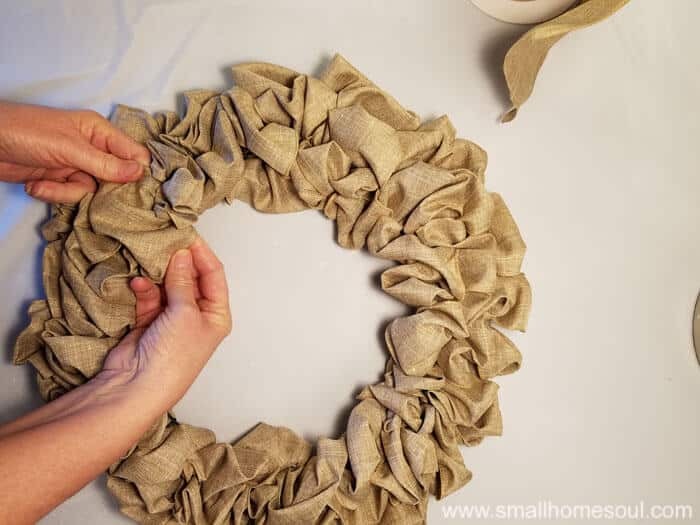 The first time I actually saw a tutorial to make a burlap wreath was when my friend Kim from Farmhouse Made crafted her burlap wreath. I never knew how they actually got the ribbon onto the wreath form. There are many ways to make this type of wreath but I followed Kim’s instructions which were very clear. So let’s get started. It’s pretty easy and goes pretty fast once you get the coordination down. 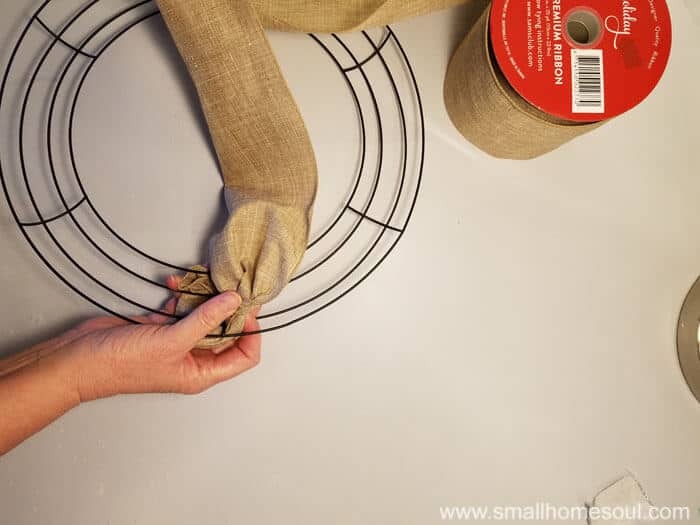 Start with your wreath form face down and glue, staple, or wire the end around the inner-most wire ring. I hot glued mine. After the ribbon is secure flip it over and starting from the inside edge push the ribbon up between the first and second wire so the loop is about the height of your index finger. Hold the first one in place while you do the same for the other two sections as you can see below. You can make your loops bigger but you’ll need more ribbon. But first, grab the ribbon loops and push/pull them tight against the cross-bar, now flip it over like Nadia Comaneci on the uneven bars. Take the long piece of ribbon and twist it 3 times so it looks like below. Then turn the form back over and hold tightly to your squished section and the twisted ribbon. 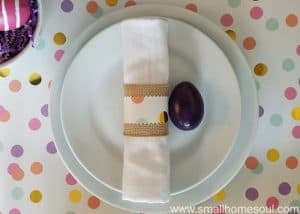 You can also use a clothes pin or something similar to hold the ribbon in place to give you two hands. Starting again from the center push the ribbon up between the wires until you have 3 loops. Squish those 3 new loops against the first three and you’re ready to repeat the flip and twist actions. With my 14″ wreath I did 4 looping sections between each cross-bar. You can add more if you want it to be more full but I think 4 is perfect. Keep looping, flipping and twisting until you are at the very end. Then just cut the ribbon and get ready to secure it. Scrunch up the end of the last loop, it will be on the outside wire this time. Wrap it around the support bar and secure it with a little hot glue or wire. Flip it over one last time and give it a good fluff until you’re happy with the look. Now adorn it with your favorite stuff and you have your very first seasonal wreath. For mine I chose some simple white picks that I saved from our Christmas decorations for a Winter Wreath. The picks are just stuck down into the wire form and will be easy to update for Easter, Spring, etc. And for your pinning pleasure! I have a storage room that is unfinished in my basement. I have started place long items in clear blue garbage bags and hang them between the floor supports. I literally have decor stuff everywhere. Storage is always such a huge issue for me. This is a great idea. 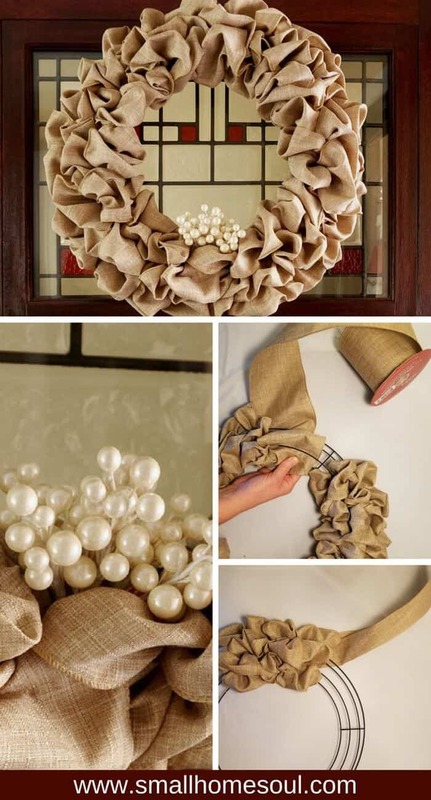 Love your wreath, so simple and beautiful. 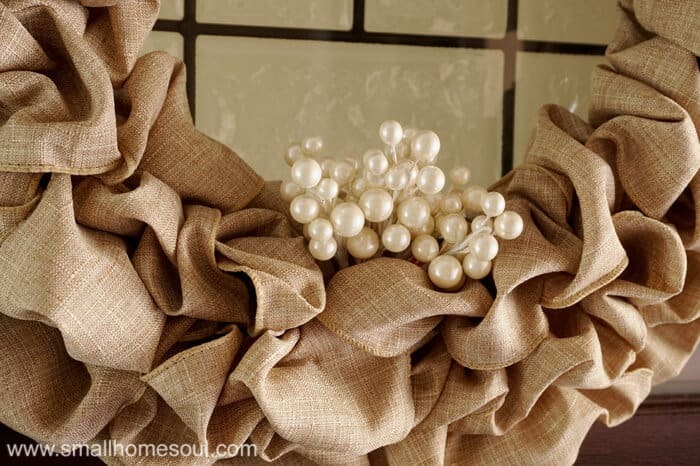 I have a burlap one that I decorate and change for the season. Really saves on space! I can’t believe I never thought of it before I saw Anika’s DIY Life do it. Thanks for stopping by today! 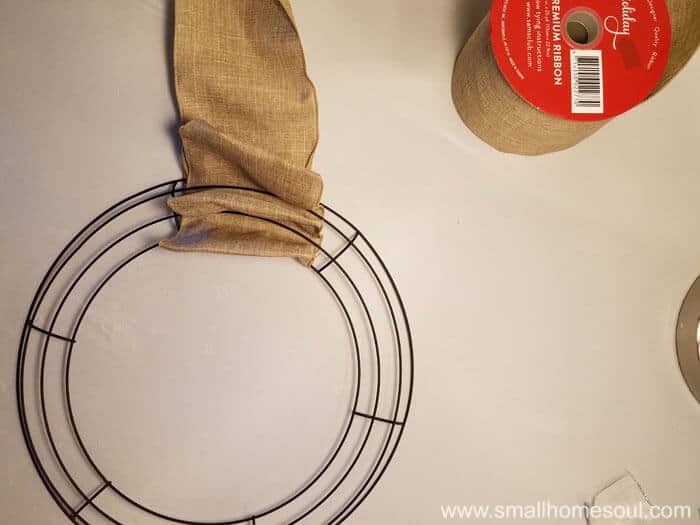 Love the simplicity of this wreath Toni! Toni, what a great idea. I too have one too many seasonal wreaths sitting in my attic. Love the idea of using just one that I can bling up for each season. Thanks for the great idea. You’re welcome Lynn, I’m glad you like it and I hope you can free up some space in your attic using the same method! Toni, Your wreath is so adorable! I knew I saved the wire part of my holiday wreath for a reason. That ribbon idea is perfect! 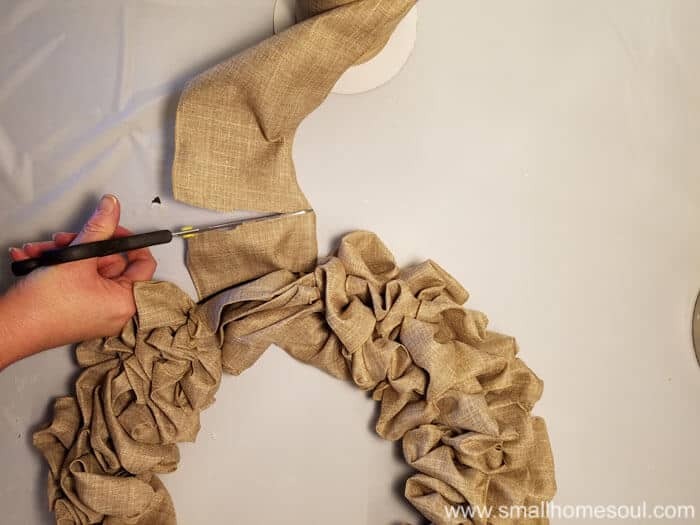 It looks just like burlap but without the mess right! Toni, I love burlap wreathes! I have always wanted to know how to make them, so thank you for sharing this! It came out great! & I too love the pearls! Super sweet wreath Toni!! I love the addition of the pearls!! I love everything pearls! !